We’re not really ones to celebrate Halloween–Ktams hates dressing up, and I’m not a huge fan of giving small children candy I know is horrible for them…but when we were invited to my dear friend Jenni’s Halloween Party, I could not turn my nose up to the holiday. Jenni’s parties, you see, are all too much fun! I am very happy with how my hooded cape turned out. It was fully lined with a black graphic print that looked sort of like clock wheels, and was quite a perfectly warm option for the cool fall night. It took about 3 hours to cut and complete the project, and I paired it with a black cocktail dress from my closet, some black stockings, black leather booties, and a few strands of my favorite costume-y necklaces. My basket was bought day-of-the-event from Goodwill for $4 and inside it I kept my DSLR, my phone, and a few business cards for any new people I would meet that evening. I dressed Ktams as the lumberjack/huntsman that saves Little Red and her Granny from the stomach of the Big Bad Wolf (hence the hatchet). 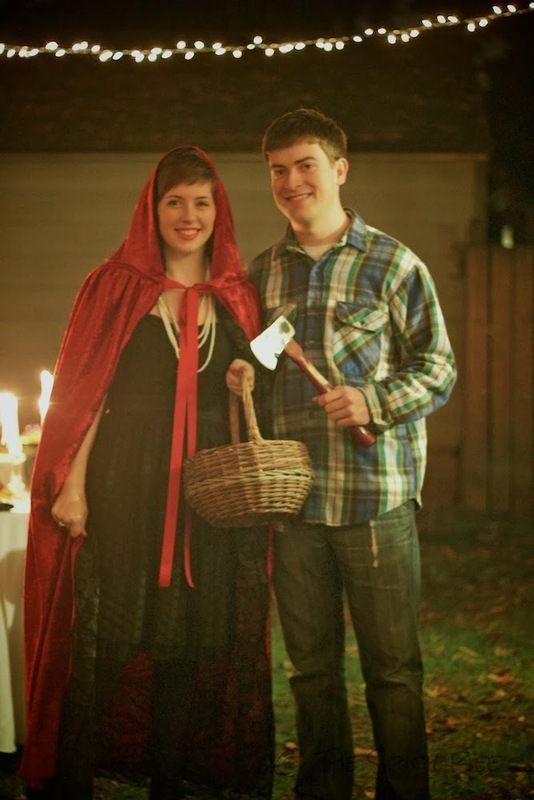 He was thrilled with how easy the costume was to wear, although he did make me carry around his hatchet most of the night! The party was a sort of potluck, and everyone brought something to fit the theme of the event. 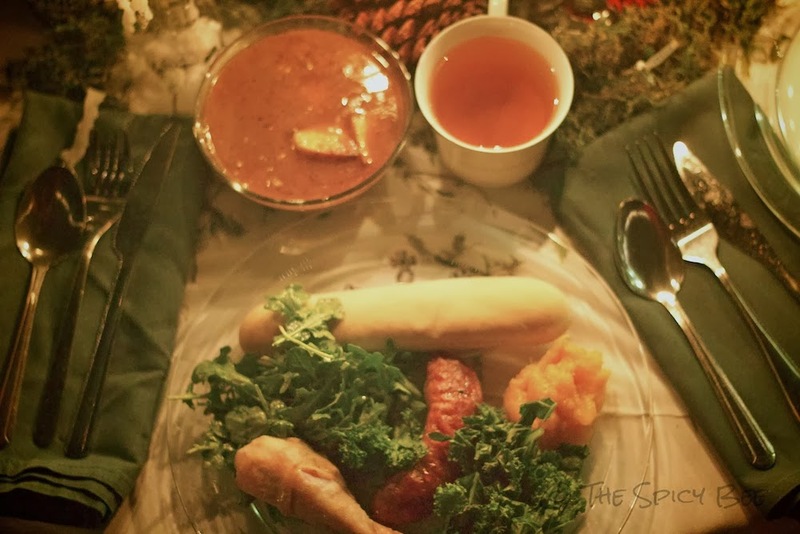 I stuffed my plate with everything from brats, to kale, to a lamb stew (which was my favorite dish of the evening!). I stuck with a spiked hot apple cider for most of the night, and for dessert I made a very special set of cupcakes that I have coined (for theme’s sake) Cinderella’s Pumpkin Cupcakes. These cupcakes were easy to whip up, and they transported beautifully. 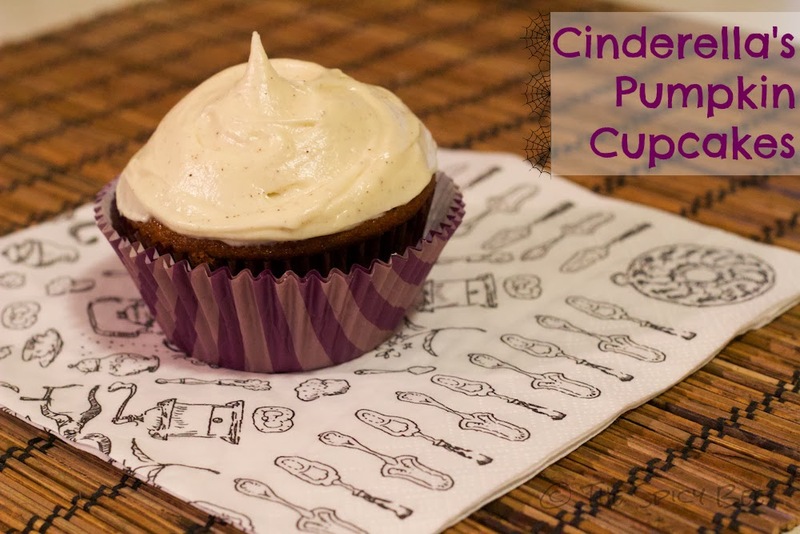 This recipe was adapted from Savor Home‘s recipe for pumpkin cupcakes. Find the original recipe here. Line your muffin tin with cupcake liners. Set aside. Preheat the oven to 350°F. In a small bowl, mix the flour, cinnamon, pumpkin pie spice, baking soda, baking powder, and salt until combined. In a large bowl, combine butter, eggs, pumpkin puree, light brown sugar, and granulated sugar. Whisk well. Add the dry mixture to your wet mixture until combined–watch for lumps. Fill each of the muffin cups about 1/4 from the top. Bake for about 16-18 min or until a cake tester or toothpick comes out almost completely clean. 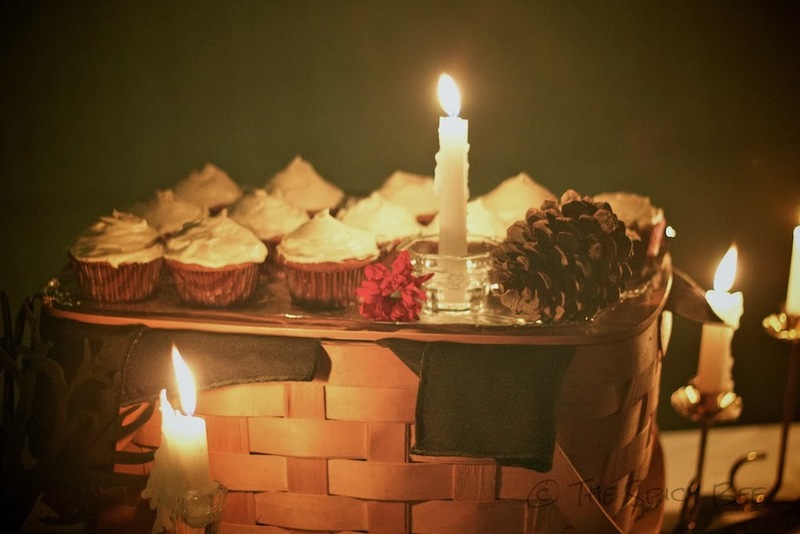 Remove cupcakes from muffin cups and place on a wire rack to cool completely. Don’t be afraid to pull the cupcakes a little early to let them finish cooking in the pan on the counter. Pumpkin is a very moist add to the cupcakes, and they will feel different to the touch for this reason. On to the frosting. Once the cupcakes have cooled, beat the butter and cream cheese for about 2 minutes on medium speed with a hand mixer, or by hand until fluffy. Slowly incorporate the powdered sugar, then the vanilla and cinnamon. Once combined, turn on medium-high and bring some air into the frosting. Frost the cupcakes and serve at room temperature. Feel free to store in fridge for maximum longevity. Makes approximately 12 cupcakes. 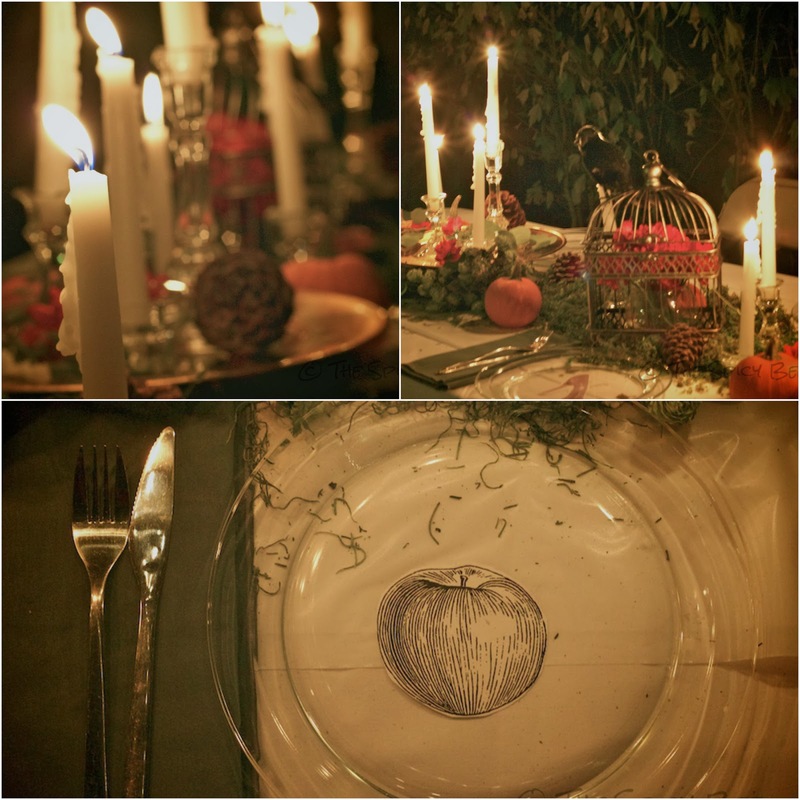 Thank you to Jenni for throwing such a GORGEOUS dinner party! What’s your favorite thing to do with pumpkin?